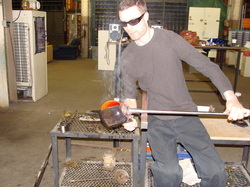 Milwaukee, Wisconsin 2006 Griffin Glass and Design was established, providing south eastern Wisconsin with fresh ideas, capabilities and capacity to produce truly unique and original works of fine art glass and design. Concept, function, design, and color theory are the foundations of our company and these foundations can be seen directly in our work. Presently we are located in Mequon, Wisconsin conveniently located close to high way 43.